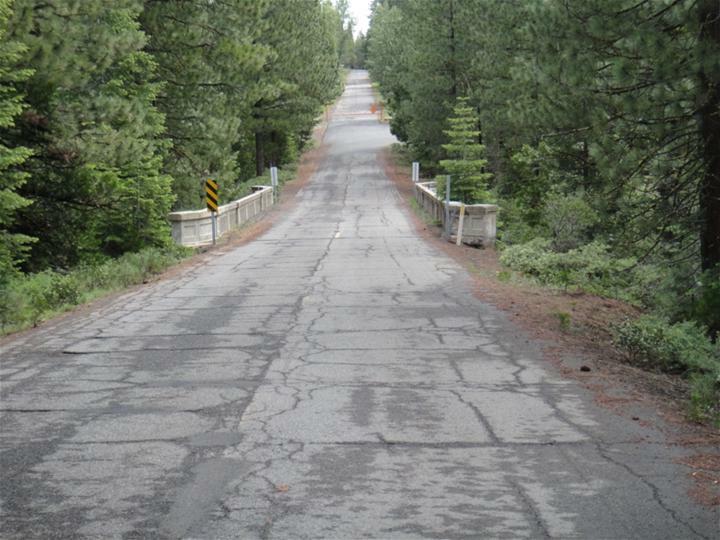 The Plumas County Public Works Department is proposing to replace the structurally deficient two-lane bridge over Bailey Creek on County Road (CR) 322A, which serves access to US Forest Service and private lands. The existing bridge was built in 1928 and is supported by concrete abutments and two concrete bents. The age of the structure has led deterioration of the concrete with reinforcing steel exposed at many locations. The California Department of Transportation (Caltrans) inspection report has classified the bridge as Structurally Deficient, with a sufficiency ration of 49.9, making it eligible for replacement with federal funding through the Federal Highway Administration’s Highway Bridge Program (HBP). 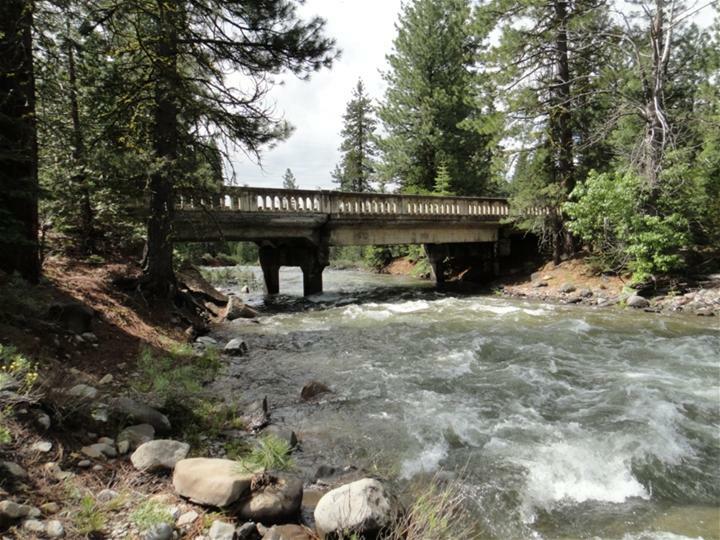 The Bailey Creek Bridge is located in Plumas County on County Road 322A, approximately 4 miles east of the town of Chester in Section 12, T28N, R7E. It crosses over Bailey Creek, a seasonal stream which carries snow melt in the spring and early summer and provides access to Federal and private forest lands north of the Lake Almanor Peninsula. Lassen Volcanic National Park and Lassen National Forest are approximately 9.5 miles to the north, the Walker Ranch Development, including Bailey Creek, Foxwood, and the Lake Almanor Country Club are located approximately 4 miles to the south. The new structure is proposed to be a single span precast or cast-in-place bridge which will carry one lane of traffic in each direction. The proposed bridge will improve the water conveyance capacity of the creek by eliminating the existing bridge columns/ piers in the creek. This project proposes to construct a temporary detour during the construction with a crossing of Bailey Creek approximately 60’ downstream of the existing bridge center-line. The detour will be in place for approximately one year. This structure was turned over to the County upon completion of a relocation of SH36 in 1966 including a new bridge over Bailey Creek. The existing bridge is a three span reinforced concrete girder bridge supported by reinforced concrete abutments and piers on spread footings. The bridge is approximately 80 feet long and 25 feet 8 inches wide and carries two lanes of traffic. The California Department of Transportation (Caltrans) inspection report has classified this bridge as Structurally Deficient with a sufficiency rating of 49.9, due to the deteriorated concrete and exposed reinforcing steel. The purpose of the project is to replace the existing structurally deficient bridge (9C-0138). The existing two-lane bridge is proposed to be replaced with a two-lane bridge which will meet AASHTO minimum design and safety requirements and be on approximately the same horizontal and vertical alignment. This project is a stand-alone project and has independent utility.